Finding a job can be nerve-racking. It's hard to know even where to begin: Where are jobs listed? What skills do you need? How can you make your résumé stand out? A job hunt involves many unspoken rules that can't be broken, and it's easy to unknowingly hurt your chances. 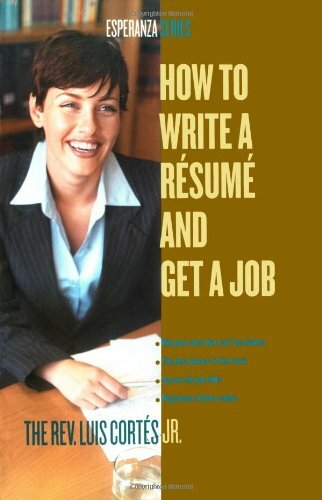 In How to Write a Résumé and Get a Job, the Reverend Luis Cortés Jr. supplies you with the necessary information for securing a promising job. He will lead you through every step, from searching and applying to negotiating for a better salary, asking for benefits, and enjoying your success. A job isn't everything, but it is your key to a better future. Following Cortés's guidance ensures that your search will be a successful one. About the Author&colon; The Reverend Luis Cortés Jr. is the president and CEO of Esperanza USA, the largest Hispanic faith-based community-development corporation in the country. In January 2005, he was featured as one of Time magazine's "25 Most Influential Evangelicals."